After Uber launched UberXL (an inexpensive SUV car service) in May 2014, It didn't take long to realize that many riders also desired a similar yet more luxurious option to choose from (for special events, business travel and more). Thus, UberSUV was born. Basically it goes like this: UberBLACK is to UberSUV, as UberX is to UberXL. In other words if you are with a bunch of friends or just want the extra room to yourself, while riding in style, then this is the car service for you. Note: Many makes & models aren't listed. This is just to give you a rough idea! After launching in 2010, Uber quickly became the world's leading rideshare service. The company revolves around a smartphone app that allows riders to request an on-demand car service, from a nearby driver that is also connected to the app, to take them where they need to be. Upon requesting a ride, you can see where your driver/pickup car currently is and how long it will take for it to arrive at your current location. Uber is currently operating in more than 677 metropolitan areas spread across 77 countries (and growing). 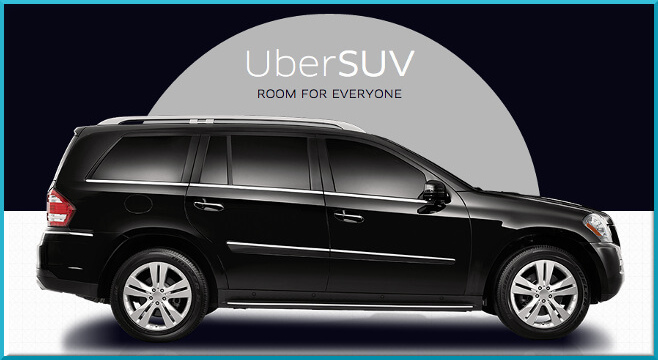 Find out how much an UberSUV will cost!